G-Out! Purge Review – Is This Product Safe To Use? G-Out! Purge is a dietary supplement that is designed to offer joint support. It is proven to help stop inflammation, fight joint pain and promote quality of life in people recovering from joint complications and joint injuries. According to the official website, G-Out! Purge is made in the USA by a company known as EU naturals. You might know it from other supplements since it is a huge supplement company. What are the ingredients in G-Out! Purge? VitaCherry® HiActives® – These are cherries packed with flavonoids and anthocyanins. These are known to have power anti-inflammation benefits. Celery Seed Extract – This is not a stranger in the joint circles. They have been used for long due to their medicinal values. They are antiseptic, anti-inflammatory and diuretic. They have a significant effect when it comes to fighting pain. Hydrangea Extract — It dates back to traditional Chinese medicine. They have a wide range of benefits which extend from the joints to the kidneys. They are known to help remove impurities and clean out toxic build up. BioPerine® – This is a patented extract derived from black pepper. It is a source of powerful anti-oxidation and anti-inflammation ingredients. 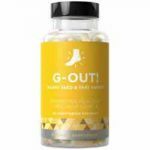 G-Out! Purge is a long term care product designed to help the body restore and protect the joints. It is packed with powerful ingredients that fight inflammation and pain associated with joints. Our body has its inbuilt mechanism that support joint functioning, however, as we age, the body is no longer able to sustain this mechanisms and this is where the product comes in. it should be taken as directed for five weeks for any positive benefits to be realized. It is flavored meaning that it will not leave a foul taste on your mouth after taking. It is made in the United States under USA laws and regulations. This product is not fortified with essential vitamins and minerals such as calcium. Such minerals are known to promote bone formation. Although it comes with a money back guarantee, the return process is cumbersome and time wasting. What is the recommended dosage instructions? The producers recommend taking two tablets daily. This can be taken in one single serving or divided into two separate servings. If you get this product from your caregiver, ignore this dosage instruction and follow your caregiver’s instruction. This product is designed for adult consumption only. Do not take this product if you are pregnant or breastfeeding unless in consultation with your caregiver. Well, there you have all the facts. This product is great on paper. We love the fact that it comes with most bioavailable ingredients that are safe and proven effective. Customers of this product are sending some mixed reactions which makes it advisable to try it yourself, after all, the product is affordable. All the same, if you are looking for a more sure way to handle your joint flare ups, then you might want to try some of the ingredients we have reviewed here.